We are beginning our unit of study on the ocean! I have been reading The Pout Pout Fish by Deborah Diesen and the kiddos LOVE it! First Grade Blue Skies has an adorable freebie on her TPT! 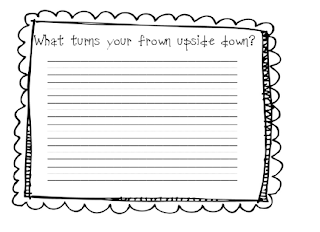 We made the fish and then I created this freebie so the kids could write about what turns THEIR frown upside down! They turned out precious! Click below for the freebie! I linked the freebie to TPT now so try again!! Here is my finished "Summer is a ball" display outside my room! Too cute! On another note....I took pictures of my little graduates today in a cap and gown! My teaching partner had this great idea for their scrapbooks and our end of the year DVD!!! I love the photo! I think I will be doing that this week to add to our memory books! LOVE the pout pout fish ideas! We just finished up our ocean (and pirate) unit this week but I will definitely be saving some of these cute ideas for next year! We had such a good time doing all the pirate and ocean stuff the last few days...if you have time you should come check out some of the activities we did! They really made the last few days fun and memorable for the kiddos. Thanks again for the ocean and especially the pout pout fish ideas! Thank you for sharing The Pout-Pout Fish with your students!